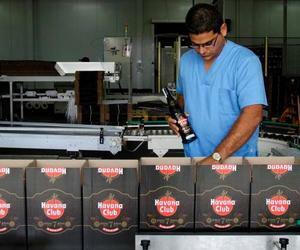 The Havana Club International company is investing in the expansion of its aged rum distillery located in the Cuban municipality of San Jose de las Lajas. According to Yaima del Pilar Rodriguez, communications specialists at HCI, said the company is about to finish a seventh aging premise and already works on building another one. She added that they are also thinking of installing a third bottling line and building warehouses to store finished products and raw materials. The distillery has a semi-automated bottling line and one state-of-art use3d for the ultra-Premium special rums, capable of bottling somewhere around 10 to12 thousand bottles an hour. Between 2007, when this distillery was inaugurated and last year, it produced 12 million 9-liter cases, at a market value of 633 million dollars. She said the facility has all international certifications of quality, innocuousness, environment-friendly management and others required to produce top quality dark rums. The Havana Club rums are made from sugar cane, aged in white oak barrels for a minimum of two years. In 2016, HCI sold four million 9-liter cases for some 170 million dollars, 28 percent of those in the Cuban market.